Yoga teachers and yoga styles have their differences, but let’s not call the whole thing off. Yoga is on the rise, and while new types of yoga are popping up right and left, it is easy to get caught pitting one style of yoga against another. It is more important that we appreciate the reason for yoga and the many ways yoga can be practiced, no matter how different each style seems to be. The original reason for practicing yoga was to get out of the dark and plug in to the light. The word guru means to bring light to darkness. People practiced yoga with a guru as a way to stay connected with the divine influences that brought them from a place of suffering into a place of joy. It is not much different today, as many flock to yoga due to back pain, insomnia, stress, and other states of discomfort. However, the recent wide-ranging variety of yoga classes and instructional differences can lead us into the darkness of confusion. Which one is really yoga? To question whether or not a class is actually yoga is to question your own motive for doing the class. Pay no fuss to the matter of this question because the answer can only be found in you. While one yoga student may feel spiritually inspired in a yoga-fitness type class, another might have the meaning of yoga totally lost on them while in deep meditation. Whether or not we are really doing yoga is entirely up to the practitioner. Do we feel plugged in and happy as a result of our practice? That is a better question to ask. Is there a right or a wrong way to practice yoga? Remember, all yoga styles began with the same goal, and that goal was to eliminate suffering. How we choose to eliminate our suffering is entirely up to us. When we choose yoga, the type of yoga is neither right nor wrong because the experience of our practice is something in and of itself. The only thing that might suggest something is wrong is if our yoga practice is not making us feel better. Why are the same poses at times taught and practiced differently? As yoga styles vary, so will the look and feel of different poses associated with their particular styles. When instructed and practiced with integrity, all poses fall within general parameters that keep them from being injurious. Even so, slight variations often leave people questioning which ways are correct. For example, one familiar rule is to always keep the knee over the ankle in a lunging type pose. However, when I first learned how to do a classic Hatha-inspired sun salutation, I was instructed to have my knee jut out over my toes in a low lunge for maximum stretch in my opposite hip. So, which one is right? While having your knee over your ankle in a lunge is very sound advice to protect the knee joint from injury, it doesn’t have to apply in every situation. A lot of these variations depend on many, many factors. How will you know what’s best for you? 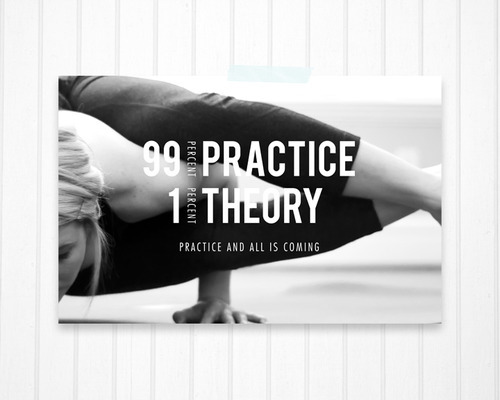 Ashtanga yoga guru, Pattabhi Jois, said, “Yoga is 99% practice, and 1% theory,” meaning all of the information in all of the text books all across the globe pale in comparison to your own practice and experience. The original yoga pioneers of ancient times didn’t discover yoga by reading a book; their understanding of yoga came from their own exploratory practice. Listen to your body and take the information you are hearing from teacher to teacher to enhance your own personal practice. It is okay to develop your own language, style, and yoga practice as long as it brings you joy. Whether you say tomato or tomahto, know that the meaning of the word is still the same. Have a comment, question, or suggestion? We’d love to hear your input on yoga and beyond.